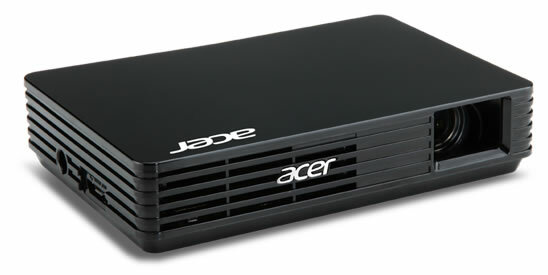 The new Acer C120 ultraportable pico projector can be powered by a PC via USB connection. The ultra-lightweight Acer C120 pico projector features an LED lamp, so it turns on instantly and is quickly ready to show vibrant images. Presentations can be enjoyed natively in the 16:9 aspect ratio at WVGA resolution (854×480) or at the maximum resolution WXGA (1280×800) in a 16:10 aspect ratio. Plus, USB 3.0 connectivity increases data transfer speeds up to 10 times faster than traditional USB 2.0 for enhanced image brightness and quality. The Acer C120 can project clearly from as close as 15.75 inches and as far as 12.14 feet away. The Acer C120 has a high 1000:1 contrast ratio that results in crisp presentations and photos. The C120 projector is ready to go nearly anywhere. It fits in the palm of a hand and weighs only 6.34 ounces. It is incredibly compact, so it can fit in a purse or briefcase; it measures 4.72-inches (W) by 3.23-inches (D) by 1.0-inch (H). The new Acer C120 ultraportable pico projector is ideal for business people, instructors and anyone who needs an incredibly portable projector to display clear, crisp images. The projector is available for approximately $259.